The main aim of the Playing Field Committee is to provide a centre point in the village to enable the community to meet in a comfortable well appointed building. To take advantage of all the hard work being done and also to ensure that the grant money allocated to the project is not wasted the Committee, who are anxious to improve village life, would like to create groups such as a Computer Club, History Group, Welsh Learners Group, Gymdeithas Cymraeg or a Senior Citizens Club – more information about these projects will be forthcoming shortly on this website. The Fund Raising Group hopefully will be resurrected at the AGM in February to raise funds for the refurbishment of the Pavilion. Next meetings -check with Rhian – everyone welcome. The Playing Field Committee are aware of the importance of utilising the Pavilion especially when the refurbishment is complete. We intend to invite interested parties to create Socities/Clubs which would be of benefit to the community at large eg Pensioners Club and a Clwb Cymraeg. Anyone with any ideas of forming societies in the community please contact Ann, Rhian or Amanda. Also in the Vale as a whole, any Club or Society who are homeless please contact us – we may be able to help. Picnic in the Parc was held on Sunday 26th August, 2012 on the Playing Field and a Race night was held in the Drovers on the 29th of September. Thanks to everyone who turned up. The sun shone on Rhewl when we finally had our Funday following the cancellation of the planned event in June due to terrible weather. It was heartening to see so many people and their children on the Playing field and enjoying themselves. The Presidents of the day were Gwynfor and Betty Evans who have recently moved from Bryn Afon to Ruthin and of course they are the parents of Rhian – the hard working Secretary of the Playing Field’s Fund raising Committee. The Sixties night in the Pavilion was a disappointment with numbers down on previous similar events – the Fund raising Committee would like to hear your opinion on this and any ideas on other fund raising ideas. Wednesday 23rd May, 2012 A very successful evening was held with a profit of over £160 being made. Thanks to Jean Wallis and her team for all the good work. Another successful Bingo night was held with over £120 being raised. Bingo night A very succesful Bingo night was held on the 21st, September at 7:30pm in the Pavilion. The caller was Mr Ifor Thomas. Entertainment evening with Bov and John Sellers A sold out evening was held on the October 8th in the Pavilion with John Sellers and his band The Asylum Seekers and Bov leading his choir Y Porthmyn – provided wonderful entertainment. John Price and Bov’s sister Eirlys both sang individual items. A very worthwhile Auction was held. Fun Day : the 2011 Fun Day was held on Saturday 18th June. It was opened by Mrs Hilda Lewis and the committee were extremely busy to ensure a very enjoyable day for everyone. It was a beautiful day and there were many events and stalls for punters to enjoy. The evening finished in the Drovers Arms with the Choir (Cor y Porthmyn) singing their way through their repertoire and having a good night. Cheese and Wine Evening – A free Cheese and Wine evening was held on Wednesday June 1st and everyone who attended agreed that it was a lovely evening and a profit of over £200 made it all worthwhile. Chairman Ann Carroll welcomed everyone and Mike Denman gave a report on progress on the Pavilion Refurbishment. Mrs Hilda Lewis unveiled a plaque thanking the Morris Dancers for their generous contribution to the Playing Field Funds. Highlight of the evening was a performance by the Drovers choir(Cor y Porthmyn) who were in fine voice. Bingo Night – A Bingo evening was held at the Pavilion on 20th April. The caller was Ifor Thomas and the night was very enjoyable and a profit of nearly £180 was made. An evening with Bov and friends : a very succesful evening was held at the Ruthin Conservative Club on Friday 18th February 2011. Over £900 profit was made on the night and the committee would like to thank everyone who attended for their generosity. The demand for tickets was unbelievable and the lucky ones who attended enjoyed an excellent evening, The new Drovers Male Voice choir following hours of practice were in fine voice. There are two videos filmed by Emyr Hughes on the YouTube website – type in the words Only Rhewl Aloud in the search box to find these two masterpieces performed by the choir. The Committee would like to thank all the artistes who took part. Cheese and Wine opening evening – Held at the Pavilion in July – Great evening – over £450 raised. Bingo evening – Held at the Pavilion with great support from everyone – over £600 raised. Pampering at the Drovers – Organised by Rhian and loads of Ladies attended to beautify themselves for their partners – £130 raised. Thanks to NEW IMAGES (Bolero Camp,Park Road, Ruthin – 01824 705830) for their support. Hair raising Waxing at the Drovers – Gags and Hesh were our heroes when they volunteered to become waxed and allowed strips of paper to tugged off them thus enabling chunks of body hair to be removed. They both worked extremely hard to raise sponsorship money for their efforts and a staggering amount was raised (at the moment over £1750). Also thanks to Laura Johnson and Adele Hughes for carrying out the waxing and supervising the event. 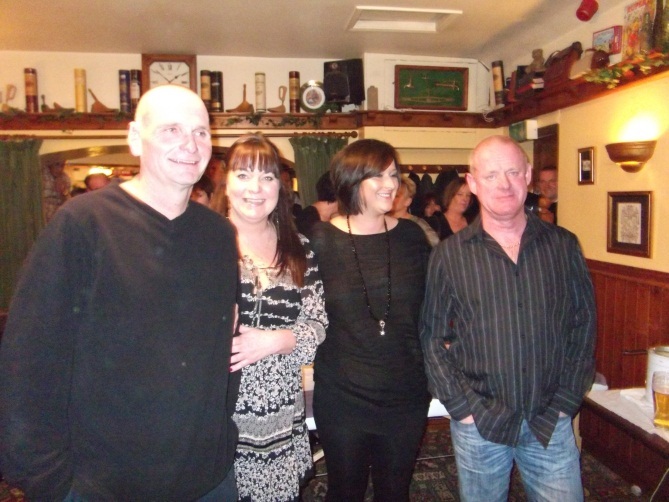 A tremendous evening was enjoyed at the Drovers which was full to the rafters. The Morris Dancers have always had a strong link with Rhewl and when the group decided to call it a day they decided to close down their bank accounts much to the benefit of our Playing Field Association. 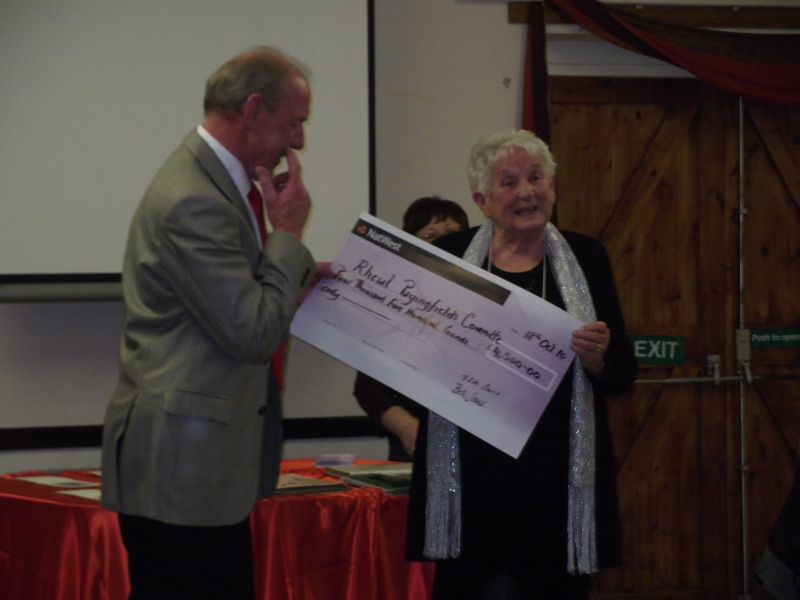 A number of Playing Field representatives attended a Morris Dancing Reunion evening held at the Pavilion too see Hilda Lewis present a cheque to Association Chairman – Malcolm Harris for £4,500. Mike Denman reports on succesful applications for grant aid:- £9200 from the Rural Key Fund (this has to bematch-funded) and also a grant for £5000 has been awarded to us from the DVSC small grants fund.